Raybould Marsh, one of "our" Britain's best spies, has travelled to another Earth in a desperate attempt to save at least one timeline from the Cthulhu-like monsters who have been observing our species from space and have already destroyed Marsh's timeline. In order to accomplish this, he must remove all traces of the supermen that were created by the Nazi war machine and caused the specters from outer space to notice our planet in the first place. His biggest challenge is the mad seer Gretel, one of the most powerful of the Nazi creations, who has sent a version of herself to this timeline to thwart Marsh. Why would she stand in his way? Because she has seen that in all the timelines she dies and she is determined to stop that from happening, even if it means destroying most of humanity in the process. And Marsh is the only man who can stop her. "Necessary Evil" is the stunning conclusion to Ian Tregillis's Milkweed series. 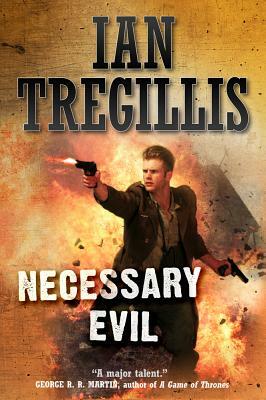 Necessary Evil is the third title in Ian Tregillis's alternate history series, the first of which, Bitter Seeds, was highly praised. Tregillis lives near Santa Fe, New Mexico, where he works as a physicist at Los Alamos National Laboratory. In addition, he is a member of the George R. R. Martin Wild Cards writing collective.